I don’t think this needs an intro. It is one of the most popular, widely used & greatly appreciated platform. In fact, you can also call it a Second Search Engine. The biggest & the most widely used social media, you would hardly find anyone who is unaware of it. While YouTube is used for Entertainment & Tutorials, Facebook is used for Discovering & Networking. it is a portal where different people connect. You get to know so many people & you can connect with them based on your interests. It is also a great platform to create community, your brand awareness, Introducing new products & their promotions. Nowadays People are using the internet as a medium to express their opinions on things. One such platform that is widely used is twitter. with just one tweet you have the power to set things right. Recently a tweet from a train passenger helped police & railway authority to save many girls from human trafficking. A platform which is getting popular day by day, while Facebook is for networking, Instagram is for influencing. People won’t look for chatting on Instagram they look for Inspiration on Insta. The best way of using Instagram is influencing people, impacting their lives, giving them hope, making them follow you because they see a part of life in you that they desire. 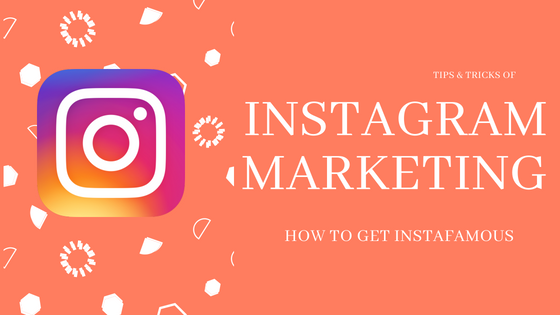 How to Get Started with Instagram Marketing? Download the Instagram app from Google Play Store or Apple App Store. 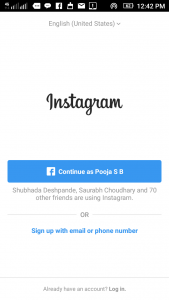 Instagram is a Social Media platform which is free to download & use but you can only access it with your phone, you can view your account via desktop site but you won’t be able to upload anything. AS soon as you log in you will be asked to enter your full name, it is the name that will be displayed on your account. So I recommend you to use your business name as it could reach more people. 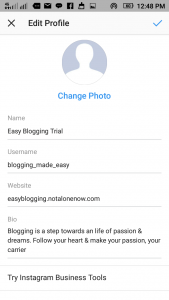 Next, you have to pick a username, it will be unique for your profile so try getting your brand name as a username if it is not available then pick something that is relevant to your brand. This is changeable later so don’t worry. Right Profile pic is crucial, it is one of the first things that catch the visitor’s eye so you can either use your brand logo or something that is relevant to your brand. but keep in mind that whichever photo you would pick it would be cropped to fit in the circle slot. so try to find the appropriate photo that won’t lose its charm after getting cropped. Bio Optimization is very important, it will grab more attention & will help your account to attract more people. Your bio can have a maximum of 150 characters so keep it simple & short, don’t use hashtags or keywords. 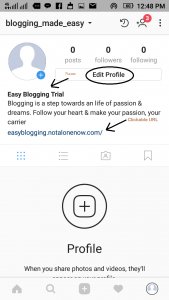 you can add one link pointing to your blog or site to drive traffic from Instagram. Instagram allows you to identify yourself as a business. which will give you an opportunity to reach more people & spread the word about your business. 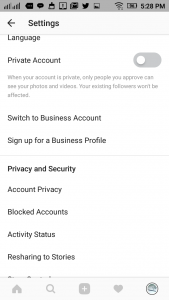 Once Instagram gets access to your FB page, you will have an Instagram Business account. By default, your account will be set to public & I would recommend you to keep it that way. You are trying to create your brand online & it will be a stupid move if you would keep your account private when you are trying to reach many people online & attract them to your brand. You can also manage who can see your stories & comment on them. it would be wise to allow all your followers to see & comment on your posts but you have an option to restrict offensive comments. online bullying is not something new when you do something people are there to appreciate as well as criticize you. 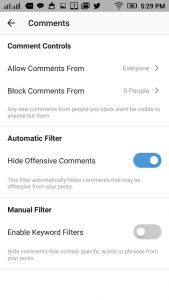 Just add the terms that you might find offensive in the manual filter (Instagram setting>> comments control) or enable “Hide Offensive Comments” feature & let Instagram automatically hide the comments that might be offensive. 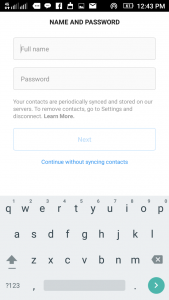 Do you log-out from one account to use another? You don’t have to do it anymore, you can use both accounts together by just switching between them. The most common myth or the phase that you’ll see many people using while addressing Facebook & Instagram is that they are similar platforms! And that is so NOT true. Yes both platforms give you the option of uploading your photos for others to see & Follow but apart from that nothing is similar, their algorithm, their features even the purpose of these two platforms are completely different. If you are someone who wants to build a brand on Instagram with this mindset then please don’t because it won’t work. Facebook is the platform that is used for networking, you can advertise, promote on Facebook but not on Instagram. I have seen many people post the same thing with the same caption on Facebook & Instagram. They inter-link the accounts to post the things on both platforms which is a big NO. Instagram & Facebook has a different audience, they might be the same people using both the platforms but they are looking for different things on these platforms. So avoid posting the same things on both. To reach more people, to get more exposure focus on photos. Great catchy photos are the biggest factor that will bring you more audience. So choosing the right pictures, using appropriate hashtags or even creating your own business hashtag are great ways to get more audience/followers to your Instagram account. The first thing anyone will notice is your profile pic so chose the one that defines you. they make the decision whether to follow your account or not based on the first 6 photos that they can find on your account. So keep your account filled with attractive photos to attract more audience. Well, this turned into a long post & there is so much more to share but I guess it will have to wait or else you will doze off reading the rest. So I’ll be splitting the content & will post it a new/next part. How to Start The Right Way! if you have any doubts or queries let me know.